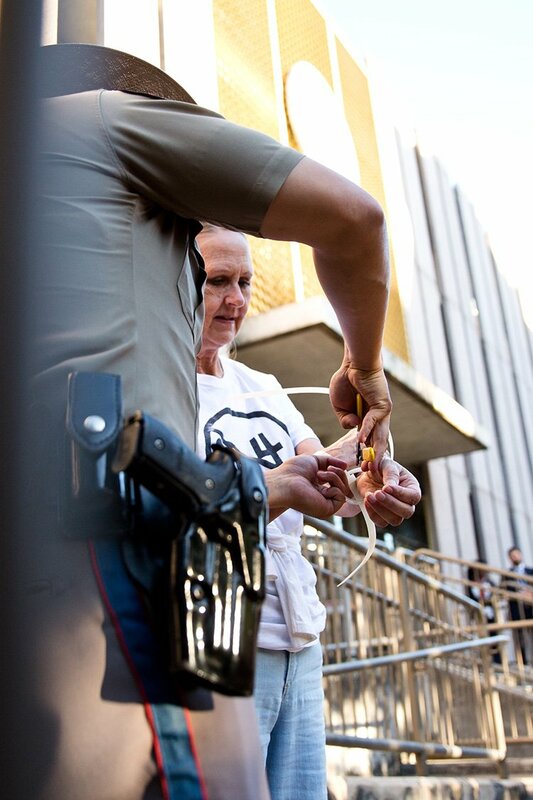 "Protesters on Texas Capitol grounds charged with trespassing" was first published by The Texas Tribune, a nonprofit, nonpartisan media organization that informs Texans — and engages with them — about public policy, politics, government and statewide issues. At least two dozen protesters on the grounds of the Texas Capitol on Monday evening were charged with misdemeanor trespassing, the culmination of a day-long sit-in. The demonstration began around 10 a.m. Monday morning when about 50 protesters took over the lobby of the State Insurance Building to protest Senate Bill 4, a measure that would outlaw “sanctuary” jurisdictions in Texas that passed out of the Texas House last week. Attorney George Lobb, with the Austin Lawyers Guild, told The Texas Tribune that protesters inside were charged with trespassing. According to Lobb, Travis County Magistrate Nicholas Chu apparently issued citations to those inside the insurance building. Lobb said he and five other attorneys tried to get inside the building to speak with their clients but were barred from entry by state troopers. Lobb said some of those charged must appear for a court date, although it's not immediately clear how many protesters that applies to. One of those handcuffed with a zip tie included Jim Rigby, a pastor at St. Andrews Presbyterian Church in Austin. He was part of the original group of protestors that descended on the state building Monday morning. Upon his release, Rigby told the crowd, who greeted him with thunderous applause, that they were all in this together now. “We are family,” he told the crowd. Austin City Council member Greg Casar, a staunch opponent of state-based immigration proposals, was also released and told protesters the fight on SB 4 was only beginning. The insurance building that was the focal point of the protest houses several of Gov. Greg Abbott’s administrative offices, including the human resources, homeland security grants and criminal justice divisions. Abbott has urged lawmakers to pass a bill this session that bans "sanctuary cities" — places where local officials do not fully cooperate with federal immigration authorities. The morning began with a modest gathering at the south entrance of the Capitol. Demonstrators made clear their intent to keep fighting the bill, even if it meant possible civil disobedience. Then the protesters told reporters to stay tuned for something more direct and began the march to the east side of the Capitol grounds. The bill would make department heads like sheriffs, constables, police chiefs and local leaders subject to a Class A misdemeanor if they don’t cooperate with federal authorities and honor requests from immigration agents to hold noncitizen inmates subject to deportation. It also provides civil penalties for entities in violation of the provision that begin at $1,000 for a first offense and climb to as high as $25,500 for each subsequent infraction. Though protesters were adamantly opposed to the bill since the start, the issue took on a new dimension last week after the Texas House amended the bill and added a more controversial measure. The amendment allows police officers to question a person’s immigration status during a detainment, as opposed to being limited to those under lawful arrest. Democrats and immigrant rights groups argue that the amendment transforms the legislation into a "show-me-your-papers"-type bill, one which would allow police to inquire into a person's immigration status during the most routine exchanges, including traffic stops. “What we're hopeful for is that communities around Texas are not just going to just lay down and accept this,” said Bob Libal, the executive director of Grassroots Leadership, an Austin-based immigrant rights groups and private prison watchdog. It's unclear what the final version of the bill will look like. After the House's action last week, the bill now heads back to the Senate, where lawmakers there can accept the changes and send it along to the governor's desk or reject the House version and call for a conference committee in which members from both chambers will meet to iron out the differences. Libal said the end goal of the protests is to convince Abbott to veto the bill, a highly unlikely outcome since the governor declared the issue an “emergency” item shortly after the current legislative session began. Abbott’s office did not immediately respond to a request for comment. Shortly after arriving in the lobby, protesters sat down in front of the building’s east entrance, barring employees from entering through that part of the building. Then half of that group moved to the west entrance and blocked that door. Attendees chanted “this entrance is closed” as employees tried to enter the ground floor. “It’s our job to tell them they’re fired and they can go to hell,” she told the group. As Monday wore on, Herrera, a former undocumented immigrant who currently holds legal residency status, said she knew she could eventually be arrested. “It’s a possibility, but if that’s the case, I know that I’m doing it because it’s my moral obligation to resist unjust laws,” she said. After more than 16 hours of debate, the Texas House of Representatives early Thursday morning tentatively gave a nod to legislation that would ban “sanctuary” jurisdictions in Texas. The marathon House debate included impassioned speeches, tears and what some House Democrats called a surprising move by a House Republican to cut short debate on adding amendments to the bill. Protesters on Texas Capitol grounds charged with trespassing By Julián Aguilar and Cassandra Pollock May 1, 2017 Editor's note: This story has been updated. At least two dozen protesters on the grounds of the Texas Capitol on Monday evening were charged with misdemeanor trespassing, the culmination of a day-long sit-in. A Department of Public safety officer removes a zip tie from a protester's wrists in Austin on May 1, 2017. Callie Richmond for The Texas Tribune The demonstration began around 10 a.m. Monday morning when about 50 protesters took over the lobby of the State Insurance Building to protest Senate Bill 4, a measure that would outlaw “sanctuary” jurisdictions in Texas that passed out of the Texas House last week. Attorney George Lobb, with the Austin Lawyers Guild, told The Texas Tribune that protesters inside were charged with trespassing. According to Lobb, Travis County Magistrate Nicholas Chu apparently issued citations to those inside the insurance building. Lobb said he and five other attorneys tried to get inside the building to speak with their clients but were barred from entry by state troopers. Lobb said some of those charged must appear for a court date, although it's not immediately clear how many protesters that applies to. One of those handcuffed with a zip tie included Jim Rigby, a pastor at St. Andrews Presbyterian Church in Austin. He was part of the original group of protestors that descended on the state building Monday morning. Upon his release, Rigby told the crowd, who greeted him with thunderous applause, that they were all in this together now. “We are family,” he told the crowd. 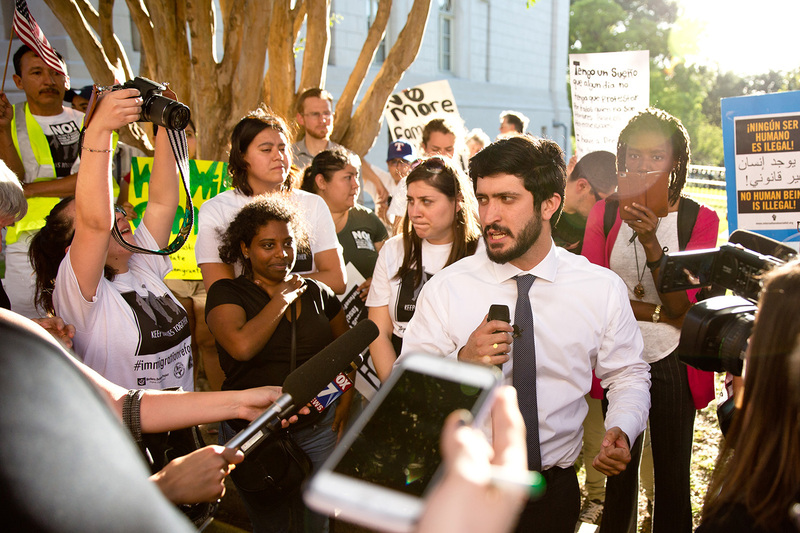 Austin City Council member Gregorio Casar speaks to opponents of the "sanctuary" jurisdictions bill outside the State Insurance Building in Austin on May 1, 2017. Callie Richmond for The Texas Tribune Austin City Council member Greg Casar, a staunch opponent of state-based immigration proposals, was also released and told protesters the fight on SB 4 was only beginning. “We know [Gov. Greg Abbott] has set his stake into passing this unconstitutional and anti-immigrant law,” Casar said. “This community, we are gonna rise up. The day he signs the bill is only the real beginning of the fight on SB 4.” The insurance building that was the focal point of the protest houses several of Gov. Greg Abbott’s administrative offices, including the human resources, homeland security grants and criminal justice divisions. Abbott has urged lawmakers to pass a bill this session that bans "sanctuary cities" — places where local officials do not fully cooperate with federal immigration authorities. The morning began with a modest gathering at the south entrance of the Capitol. Demonstrators made clear their intent to keep fighting the bill, even if it meant possible civil disobedience. Then the protesters told reporters to stay tuned for something more direct and began the march to the east side of the Capitol grounds. The bill would make department heads like sheriffs, constables, police chiefs and local leaders subject to a Class A misdemeanor if they don’t cooperate with federal authorities and honor requests from immigration agents to hold noncitizen inmates subject to deportation. It also provides civil penalties for entities in violation of the provision that begin at $1,000 for a first offense and climb to as high as $25,500 for each subsequent infraction. Though protesters were adamantly opposed to the bill since the start, the issue took on a new dimension last week after the Texas House amended the bill and added a more controversial measure. The amendment allows police officers to question a person’s immigration status during a detainment, as opposed to being limited to those under lawful arrest. Democrats and immigrant rights groups argue that the amendment transforms the legislation into a "show-me-your-papers"-type bill, one which would allow police to inquire into a person's immigration status during the most routine exchanges, including traffic stops. Protesters are dug in at state ins. building. #sb4 #txlege pic.twitter.com/rtjhhQ4YhU — Julian Aguilar (@nachoaguilar) May 1, 2017 “What we're hopeful for is that communities around Texas are not just going to just lay down and accept this,” said Bob Libal, the executive director of Grassroots Leadership, an Austin-based immigrant rights groups and private prison watchdog. It's unclear what the final version of the bill will look like. After the House's action last week, the bill now heads back to the Senate, where lawmakers there can accept the changes and send it along to the governor's desk or reject the House version and call for a conference committee in which members from both chambers will meet to iron out the differences. Libal said the end goal of the protests is to convince Abbott to veto the bill, a highly unlikely outcome since the governor declared the issue an “emergency” item shortly after the current legislative session began. Abbott’s office did not immediately respond to a request for comment. Shortly after arriving in the lobby, protesters sat down in front of the building’s east entrance, barring employees from entering through that part of the building. Then half of that group moved to the west entrance and blocked that door. Attendees chanted “this entrance is closed” as employees tried to enter the ground floor. Demonstrator Norma Herrera, a 29-year-old former staffer for the state’s Legislative Budget Board, said that every day she worked for the state “now felt like a lie.” “It’s our job to tell them they’re fired and they can go to hell,” she told the group. As Monday wore on, Herrera, a former undocumented immigrant who currently holds legal residency status, said she knew she could eventually be arrested. “It’s a possibility, but if that’s the case, I know that I’m doing it because it’s my moral obligation to resist unjust laws,” she said. Read related coverage: After more than 16 hours of debate, the Texas House of Representatives early Thursday morning tentatively gave a nod to legislation that would ban “sanctuary” jurisdictions in Texas. The marathon House debate included impassioned speeches, tears and what some House Democrats called a surprising move by a House Republican to cut short debate on adding amendments to the bill. // "Protesters on Texas Capitol grounds charged with trespassing" was first published at by The Texas Tribune, a nonprofit, nonpartisan media organization that informs Texans — and engages with them — about public policy, politics, government and statewide issues. Link back to the original article, which is located at https://www.texastribune.org/2017/05/01/protesters-launch-sit-capitol-grounds-protest-sanctuary-cities-bill/.